Nintendo is gearing up, as is always the case, to make a splash at PAX West in Seattle. Download games will be at the core of that again, with another [email protected] event leading the way among other goodies. 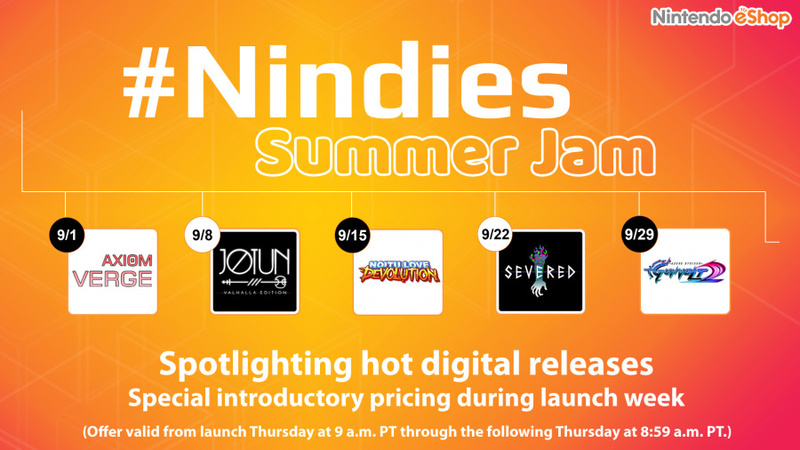 Nintendo of America has now announced the 'Nindies Summer Jam', which will bring a notable release every week in the region along with a 10% launch discount. More Nindie release dates have also been confirmed, with the most high-profile (arguably) being confirmation that SteamWorld Heist will arrive on the Wii U eShop in North America on 30th September (perhaps NoA meant Thursday 29th September, we'll find out). The full line-up and a rather tasty sizzle reel are below. What do you think of the Summer Jam line-up and 10% discount coming to North America, and of the upcoming line-up of eShop games? Let us know in the comments. Interesting. I wonder if we're gonna be able to play demos of those games, like last year. I'm not always huge on indies, but there are some good looking ones here. Too bad I'm low on cash. Not sure what would be best here. 10% do you call this discount ?? Soul Axiom is still alive? I'm looking forward to the reviews. And yes, Hollow Knight! Can't wait to get my hands on that one. @ThanosReXXX It's from the same guy that's been making The Iconoclasts for a couple of years now, for those who know about that game. 10% isn't much but I was planning on buying most of those launch titles anyway. Whatever happened to the nindies like ANNE? They made a big deal out of many of those and barely any of them appeared. @ThomasBW84 Why didn't you guys cover the 42 second Zelda clip that NoA and NoE promoted yesterday? It's not much, but at least Nintendo acknowledged it's existence once again. I'll be looking forward to severed on wiiu - this reminds me that I need to pick up Steamworld Heist still. I plan on getting it for the 3DS though. Slightly on-topic: whatever happened to Kerbal Space Program? Is it still coming to the wiiu? I feel I e heard anything since last year. @Dave24 ANNE is still in progress, I think they said March 2017 for release on their page? I'll be getting Azure Striker Gunvolt physically. The others I'll consider. Forma.8 is now a 3DS game? If so that is the most disappointing news since we lost RIVE. A misprint or the lamest news of the day (in before the download update DOH!)? EDIT: Oh I see now, it is "also" coming to New3DS. 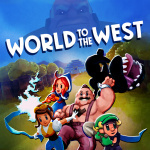 Wow, I didn't realise World to the West was coming so soon! Lots to love there. Axiom Verge, Shantae, Stardew Valley and World to the West are all day one buys for me. Lots of the other titles will earn serious consideration as well. @peeks For a game that is brand new 10% is the best you can get. Super hyped for stardew valley! I got by without an external HDD did my Wii U for a long time. Now it ends as I JAM it with these Nindies. I wouldn't place Gurumin as an indie game considering Falcom's a pretty big name in Japan. I'm glad to see the eshop getting a lot of good indies. It seems like it's been a long time since it was regularly getting games I wanted. I have a lot of interest in at least 6 of those games. Add in a few I need to know more about, and that's about 2 a month for the rest of the year, which is pretty good. If you buy Severed when it comes out on the Wii U, will you get the 3DS version when it releases? There are quite a few dark games in there, but there are also some bright and colorful titles like Shantae, Jotun, and Stardew Valley. There are also a bunch that don't seem to have any info or pictures on this site yet. Oh hey, Hollow Knight! I'm glad to see the Teslagrad guys are working on something new. 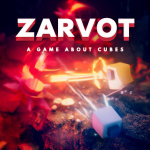 ...oh wait, those guys are actually working on that weird puzzle game? Hollow Knight is from some other guys? It looks like the exact same game, but with grosser superficial themes...and now that I think about it, I didn't actually like Teslagrad. Maybe World of the West will be more my thing? EDIT: Hm, actually, Hollow Knight doesn't look too bad. At least you can actually take a hit or 3 before you die, unlike Teslagrad. That game desperately needed a health bar. Oh hey, I forgot about forma.8...it's from the Futuridium EP Deluxe dev, though....wait, those levels aren't procedurally generated? Now I want that, too! Wow, this it turning out to be my lucky day! EDIT: I think I'll just get Stardew Valley on the Wii U, too. The Steam sales aren't quite what they used to be, so I don't think it'll go down to like, >60% off before the eShop version releases. So that's 12 games + a DLC, with another currently out that I'll grab soonish. A high number of great games!!! So Hollow Knight is actually confirmed for December?! This is the big news I've been waiting for! This is a great trailer BTW. Nicely done. I will be picking up a lot of these games, what a great line-up from the Nindies. Wow, all those indie games...they all look so boooooring! Considering some of these games have already released elsewhere and are well-regarded, and others are from established developers, I don't think they can rightfully be called rubbish. Perhaps they're not your cup of tea, but that doesn't make them bad. I would also mention that it's not really NoA bringing these games to us. I'm sure they work with the developers, but Nintendo doesn't publish the indies on the eshop. Likewise with the Hello Kitty games. Nintendo doesn't publish them, and it was the publisher that chose not to bring them over. Nintendo probably had nothing to do with it. Aside from the recent localization controversy over JRPGs, NoA has actually done a pretty good job bringing Nintendo's games to America. Off the top of my head, I can't think of any we didn't get (there might be some I don't know about). Thing is, Nintendo hasn't been releasing many games recently, so there haven't been many games to bring over. I'd get Noitu Love if Nicalis had some decent support for my country. I guess I'm out depending on the price. @rjejr Likely because at this point most of us are saying: "F&@K clips, give me the game!" by now. Well, it is the Nindies and not the Virtual Console but it makes me a little happy that perhaps my complaint a few days ago didn't go unheard. It is more than a little insane that we cannot know until the day of release what is going to be on the eShop for anything. 7+ years ago Xbox was even managing monthly release schedules for Xbox Live Arcade, there is no good excuse for Nintendo keeping people in the dark. Now if they would have just done that for the Virtual Console too... I really want to know if there is any hope of seeing Final Fantasy I-VI on Wii U Virtual Console this year (even the GBA versions would be appreciated at this point). Cool, My son is 10 years on the 31. august has been asking several time about Soul Axiom since the demo came out, i think that demo cam during the summer, so he must have been 8 at the time (He might be almost old enough to actually play the full game now). It's good to see that Nintendo is finally getting some good indie games but I won't be getting any of them for the wii u console. Done own some of them elsewhere so I am go on indie games right now, I am going to be getting some more retail xbox 1 games and might even pickup a PS4 console instead of indie games for the wii u. I am done with the Wii U console until maybe Zelda comes out for it that will be my last wii u game. Not going to just jump to the NX like I did the Wii U console. I'm just waiting on Pirate Pop Plus (which is also going to be cross-buy, so that's cool). That's actually a pretty impressive selection of titles there. It looks good, but i'm none I really want to get ASAP, more like wishlist fodder when I run out of new experiences. At least I see myself not rushing to get a NX right away either, got a nice sizable backlog. Half of these look really good and the other half look like complete crap that belong on the app store. In other words, indies as usual. Did Shantae just get slyly delayed into October? Supposed to come on September 27th. 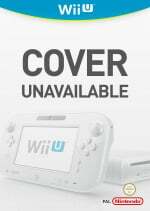 Is the Wii U version coming later or something? No Nindies for November? Perhaps NX reveal month? I honestly completely forgot that Stardew Valley was coming to Wii U, now I am super stoked for it! Axiom Verge is high on my to-get list too. I'll probably at some point get Shantae and Stardew Valley, all I care about. Calling bright, colourful games like Shantae and Stardew Valley "rubbish" is more proof of your monumental ignorance. There's a thing called YouTube and Google. @rjejr I just thought it was a random tweet because there's nothing else going on, to be honest. No new areas or anything there, just a nice bit of social media to tick those accounts along. I've actually been wanting to try Jotun maybe i'll think about getting it for my wii u. Then again i can probably wait for a steam sale and get it way cheaper lol. um, don't you guys at NL have a category for "Random"? I've seen you guys print articles about a lot less. Way way less. Not complaining, I happen to like esoterica, just thought it was note worthy as NoA tweeted something about a non 3DS game for a change. I really think they are preparing us for a handheld w/ tv out as you guys, mostly Damo, have been saying. "There's no play like it" is just too close to "There's no PLACE like it". All handhelds all the time. Maybe they'll call NX AHATT. No worse than Wii U.
Exile's End is notably absent from this list - I guess it's been delayed? I knew Stardew valley would come to eshop, but Wii U? Here's hoping for a portable release so we don't slip into comas in our living rooms. @rushiosan - I'm pretty sure Nacilus has nothing to do with Noitu Love: Devolution. The love dev cucle might've made it seem that way, but trust me, that was just Konjak's perfectionism (been following this game since 2010, if not earlier). Hopefully once this is out, he'll be able to focus more on Iconoclasts instead of juggling too many things at once when he basically does everything himself. EDIT 2: Oh yeah, that's right, Windows 10. Everythings in settings (though I had to search for it, like every other necessary option on this damn machine. What's the point of categories if none of them make sense? ).